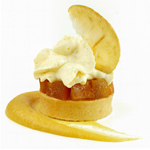 Town & Country Fine Foods are proud to be the exclusive distributor of La Rose Noire in Britain. 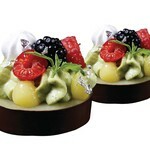 In 1991, Gerard Dubois opened the first La Rose Noire patisserie, a 30-seat restaurant and cake shop, in the most prestigious shopping mall on Hong Kong island. From an initial selection of just 28 high quality items, La Rose Noire has turned into a globally renowned enterprise, leading the way in fine bakery and pastry products, with a range of over 500 exquisite varieties. 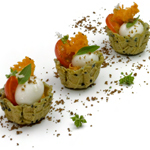 Over the course of his career, Gérard has won numerous distinguished awards at some of the most esteemed culinary competitions, including the award for Best Dessert Book in the World 2012 for his cookbook “Crafted Passion”. Passion sits at the heart of La Rose Noire. At their state-of-the-art facility in the Philippines, products are handmade, hand-filled and hand-packed to seal in the exceptional quality that has built their reputation. 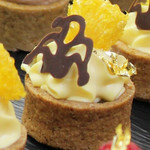 Their extensive product range includes beautiful hand-crafted chocolate shells and décor made from 69% single origin couverture, handmade pastry cones and tart shells in sweet, savoury and neutral flavours, a delightful selection of frozen and semi-finished desserts and finally, a collection of durable product stands and holders for impactful serving and display. 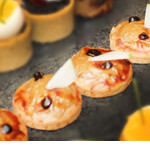 La Rose Noire’s iconic lines are perfect for memorable Afternoon Teas, Events, Banquets, Celebrations and Fine Dining. Every La Rose Noire purchase benefits the La Rose Noire Foundation, a non-profit education institution, established to provide and maintain a scholarship fund for the benefit of underprivileged young adults in the Philippines. Their mission is to improve the well-being of the poor and marginalised sectors of local communities, by extending grants to young people and enabling them to benefit from their charitable, educational and social welfare programmes. Hand-crafted tart shells in lemon, strawberry, green tea & multi grain flavours perfect for Afternoon Teas, desserts and events. 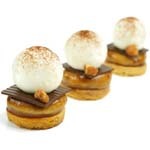 Charming selection of finished desserts: Macaron, Les Petitclairs, Les Tartes Passion, Les Chouchous, Les Eclairons & Les Carolines. 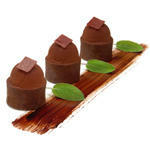 Charming collection of decorative chocolate leaves. 69% single origin chocolate wave shell, generously filled with ganache in 6 flavours: dark chocolate, milk chocolate, caramel, hazelnut, pistachio & cinnamon. Hand-crafted mini tart shells coated in chocolate and filled with lemon, apple vanilla, pear chocolate, apricot almond, chocolate praline & caramel almond. 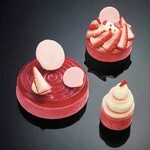 Delicious collection of macarons perfect for Afternoon Teas, Events & Celebrations. Intricate dessert with a sponge layer, flavoured filling, chocolate-coated crumble, topped with half a macaron shell dipped in chocolate & all sitting within a decorated chocolate shell. 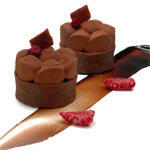 69% single origin chocolate shell hand-filled with a layer of pâte de fruit & topped with ganache, with 6 clean flavours. Introducing a fresh new range of deliciously flavoured Macarons for 2019, including Banana, Coconut, Cherry, Hazelnut, Mango, Milk Chocolate, Pistachio & Speculoos. 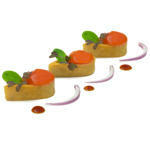 Collection of 6 dainty petits cheesecakes, ideal for Afternoon Teas, Banqueting or individual desserts. 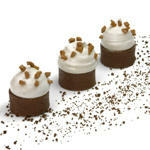 Introducing La Rose Dessert Cup, Dark Chocolate Comet, New Size Chocolate Shells, Couverture Curls & Chocolate Discs. 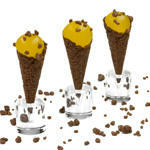 From bite size mini to large, round shells to tall cones, whatever your requirements we are pleased to oblige. 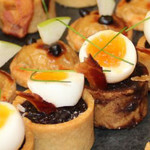 Hand-crafted mini tarts filled with various delicious savoury fillings perfect for buffets, canapes & events. Pre-baked tartes made with AOP Butter, neutral in flavour and delicately flaky in texture, suitable for sweet and savoury fillings. 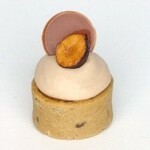 8 new single flavour variants; Banana, Hazelnut, Cherry, Speculoos, Milk Chocolate, Pistachio, Mango and Coconut. 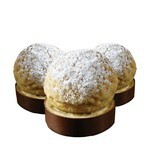 Macaron shells are hand-filled with pâte de fruit and creamy mousseline filling and hand-splash finished. Made with non-AZO colourants. Artistic Chocolate Leaves (in Dark, Milk and White Chocolate). Globe, crater, moon, & galaxy shapes available. 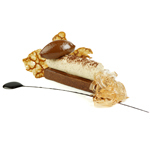 Hand-crafted 69% single origin couverture chocolate shell with a layer of pâte de fruit and topped with ganache. Hand-crafted tart shell coated in chocolate. 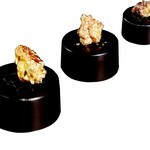 Caramel almond, lemon, pear chocolate and apple confit flavours available. Pre-baked tartes made with 24% AOP French butter. Hand-crafted with a neutral flavour, suitable for sweet and savoury filling. 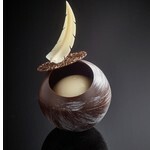 Hand-crafted 69% single origin couverture chocolate wave shell with ganache filling. 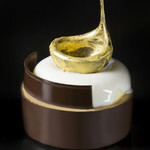 A quick demonstration of how La Rose Noire hand make their sweet and savoury baskets. 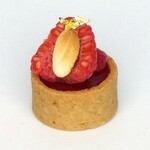 A quick demonstration of how La Rose Noire hand make their sweet and savoury tartshells. 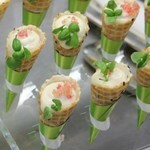 A quick demonstration of how La Rose Noire hand make their sweet and savoury cones. La Rose Noire Foundation is set to be the leading benefactor in serving and uplifting the lives of the underprivileged youth of society to become highly productive and promote competitive individuals in the educational and industrial community. The making of the third in Gerard Dubois' series of cookbooks. Crafted Passion artfully displays the versatility of the latest creative line of products from La Rose Noire. 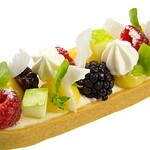 "Mini round hand made vanilla tart shell with white chocolate coating., Handmade, straight edge tart with pure butter & vanilla. Lined with white chocolate"
"Mini rectangular hand made vanilla tart shell with white chocolate coating., Handmade, straight edge tart with pure butter & vanilla. Lined with white chocolate"
"Mini square hand made vanilla tart shell with white chocolate coating., Handmade, straight edge tart with pure butter & vanilla. 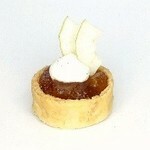 Lined with white chocolate"
"Handmade, straight edge tart with 25% butter & herbs. Hand coated"
"Rectangular hand made savory tart shell with egg glaze coating, Handmade straight edge tart, made with butter and herbs & coated in egg white to preserve." 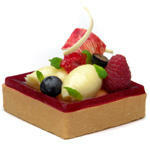 "Handmade, straight edge thin rectangular shape savoury tart. Made with butter and herbs and hand coated." "Handmade, straight edge thin rectangular shape sweet tart. 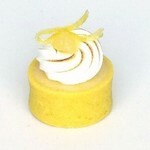 Made with butter and vanilla and hand coated with white chocolate."